Transform your home, office or commercial space with our friendly service and extensive range. Our Murwillumbah lighting shop has a superb range of lights, fans, specialist fittings, replacement bulbs – everything you need in store or to order through our wide-ranging supplier catalogue. Visit Larkin Lighting and Electrical at 12 Wharf Street Murwillumbah. Cool your home and create fresh breezes all year round with our range of ceiling fans and exhaust fans from our Murwillumbah lighting shop fitted by licenced electrical contractors. Huge range of styles available. Conditions apply. Energy efficient LED lighting offers a simple way to make savings on your power bills. Small changes can make a big difference. ask us about switching to LED lighting today. Conditions Apply. Choose from our range in store – light fixtures, fans, specialist fittings, replacement bulbs – or access our huge catalogue range including all the latest lighting trends. 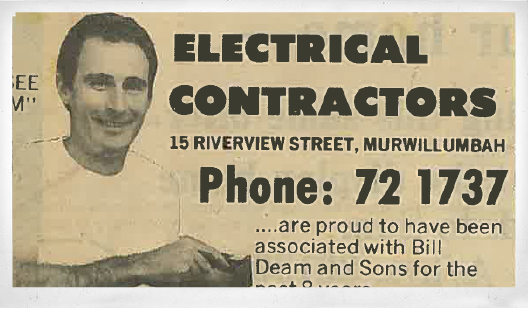 Our Murwillumbah lighting shop has been serving customers across the Tweed for 50+ years. We are members of The Lighting Network – independent lighting retailers with collective buying power so we can pass on savings to you. Not sure what you’re after? Our specialist consultants can help you choose light fittings, fans or design a plan based on your personal tastes and project needs. We also love problem solving for those tricker jobs. Ask us about a lighting consultation today. Call ahead to make an appointment with one of our experienced Murwillumbah lighting shop consultants or come in and view the range. Hey, that’s groovy! Lighting design has changed considerably since the 1970s and 80s. Back in the day, many new home owners were experimenting with coloured glass and new materials while others preferred a more traditional look. Larkin Lighting and Electrical has a huge range of lighting designs and styles to suit your space. Ask us about our lighting design service or visit the showroom at 12 Wharf Street Murwillumbah.